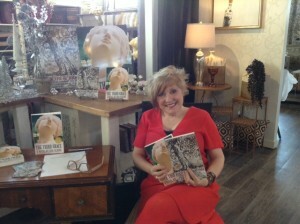 I spent several hours yesterday in the lovely environs of Annie McGuire, an interior design studio in Medicine Hat. I signed a few books, had lovely chats with several readers, and met another local author. It was an altogether pleasant day. Most of my writerly friends declare themselves to be introverts and, indeed, an extroverted personality like mine isn’t seen often in authorial circles. Generally writers find the solitude of writing to fit their natural impulses. Now, I love the focused aspect of writing alone in my home with no one else nearby, with phone silenced and no music to interrupt me, with only the keening of the wind and the kitchen window view of our little red barn to inform my senses. This leaves my imagination unhampered. However, my extroversion needs feeding! So a day with the lovely ladies at Annie McGuire did my heart a world of good! I’ve almost completed writing and editing (first round) on my new novel and am looking forward to hearing back from a few publishers considering it. Meanwhile I’m not forgetting my first novel, and lately I had the honour of being featured on The Mighty Pen–an excellent program on HopeStreamRadio. 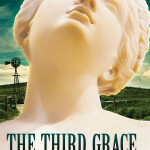 For those of you who’d like to hear me read a bit of The Third Grace, check it out! In celebration of typing “the end” to my second novel, I brewed up a wonderful soup (made to the tastes of Libby, my main character), which I have dubbed Drunken Pepper Beef Pot. Besides the obvious ingredients of roasted bell peppers (the surplus currently drowning in Spanish olive oil and awaiting a salad in my near future) and chunks of cold beef roast (and various other leftovers, making this a variation of “Fridge Soup” spoken about elsewhere in my blog), I added a healthy bouquet of fresh parsley, about half a bottle of red wine, and a swig of maple syrup. 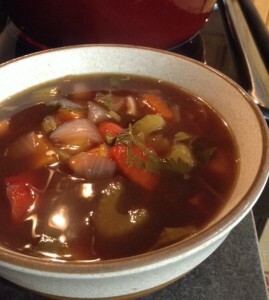 This pot of soup deserves a rainy day! Come share a bowl with me–or, at least, get ready to read my novel, when I can find a publisher for it. Congratulations on the writing of the final word of your second novel, “the end”. I can’t wait to read it! Yesterday I made the mango dessert to share with a friend. It was so delicious I will make it again soon. 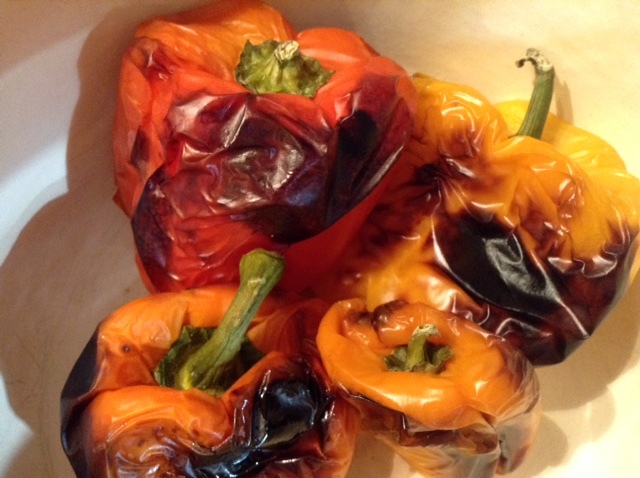 You come up with wonderful recipes! I got it from my momma! (I think I’ve quoted that line to you before?) You are a wonderful cook, Mom! I wish i could share a bowl of soup with you. ..
Oh yes, Christelle, me too! The French know all about soup (except I didn’t care for the canned lobster bisque I bought at Carrefour), so I have a lot to learn from you! The waiter brought me cheese, indeed, but cheese cut up into contemptibly small pieces; and it is the awful fact that, instead of Christian bread, he brought me biscuits. 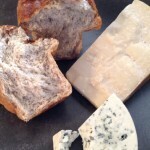 Biscuits—to one who had eaten the cheese of four great countrysides! Biscuits—to one who had proved anew for himself the sanctity of the ancient wedding between cheese and bread! I addressed the waiter in warm and moving terms. I asked him who he was that he should put asunder those whom Humanity had joined. I asked him if he did not feel, as an artist, that a solid but yielding substance like cheese went naturally with a solid, yielding substance like bread; to eat it off biscuits is like eating it off slates. I asked him if, when he said his prayers, he was so supercilious as to pray for his daily biscuits. He gave me generally to understand that he was only obeying a custom of Modern Society. I have therefore resolved to raise my voice, not against the waiter, but against Modern Society, for this huge and unparalleled modern wrong. 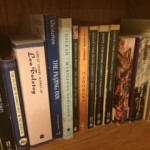 I lurk on a few writers’ online message boards, and the other day someone posted about his dislike of “literary fiction” (as opposed to “genre fiction,” such as historical or mystery novels). Several subsequent responses showed this abhorrence to be common. 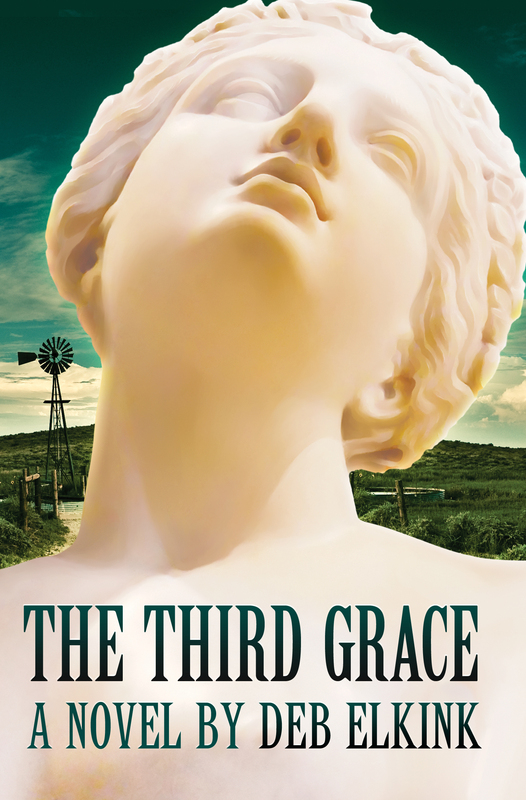 Now, my stories have been described by some as literary, which I take as a compliment, even if my first publisher for marketing purposes insisted The Third Grace be categorized as a “contemporary women’s” novel (in other words, genre fiction). I sometimes wonder if there’s a contest going on among literary writers to use the most arcane vocabulary. (See how I did that—slipped in the word “arcane,” meaning understood by few? Admission: I actually had to look it up to double-check its meaning. But then, I like the dictionary.) What makes fiction literary, anyway? Literary fiction is a term principally used for certain fictional works that hold literary merit . . . works that offer deliberate social commentary, political criticism, or focus on the individual to explore some part of the human condition. Literary fiction of this sort, fuelled by Christian thinking, can create real and enduring works of art. Poisonwood Bible (I ground my teeth through Kingsolver’s underlying message and disdain for faith, but the literary merit was fantastic, and it all caused me to think about how I myself would have written her story). And so on—you get the idea. We all have our own tastes and opinions when it comes to writing and reading. Well-crafted genre fiction is fantastic for entertainment, and I devour it at night or on the beach. But I really value literary fiction based on a soundly biblical worldview, and I wish many more Christians would set their sights on writing literarily in order to introduce the gospel of Jesus Christ (not blatantly but thematically and symbolically, evangelizing through the back door of story) to an audience thirsty for literature that takes them into deeper meaning—perhaps back to the Bible itself. Who better than Christians to comment on culture, politics, the human condition? Who more prepared than Christians to bare heart and soul in emotional journey that explains the universe and ourselves? What fiction have you read lately that touches you deeply? Do you shy away from reading literary fiction and, if so, why? What novel, for you, is the perfect blend between “entertaining” and “meaningful”? ANNOUNCING THE JUNE 1 RELEASE OF MY NEW BOOK! 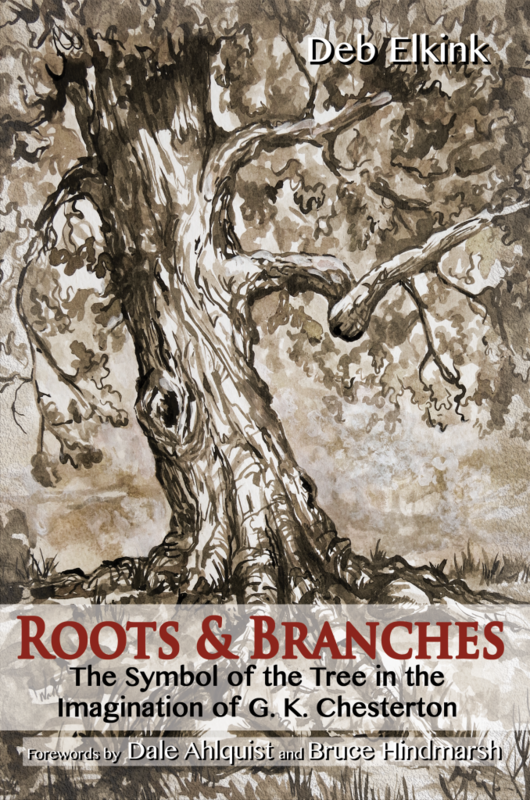 Roots and Branches traces the image of the tree throughout the fiction of G. K. Chesterton, interpreting the underlying message of his religious convictions through biography and literary analysis. This book introduces the uninitiated to a classic British author, allows students of Chesterton to mine his enigmatic work for metaphysical connotation, and encourages current-day writers to build symbolism into their own stories. So if you’ve ever wondered what good ole GKC might have meant with his rather abstruse fiction, you’ll enjoy reading Roots and Branches. If you’ve only vaguely heard about him (maybe watched one of his Father Brown mysteries on BBC), Roots and Branches is a good intro. If you, like me, are a writer looking to enrich your own fiction with symbolism (the reason I chose GKC as a research subject in the first place), this is the book for you! BACKSTORY: I was minding my own business and working on my current novel last fall when, out of the blue, I got a strange email from a man asking for more info on an article I’d written about a novel he was reading (The Flying Inn). He introduced himself as a charter member of the Central Florida American Chesterton Society (the ACS has something like 85 chapters throughout the States, with some international presence as well as a quarterly magazine, Gilbert). I answered his questions and was in turn answered by . . . silence. Three weeks later he contacted me again with his true motivation: He was a small publisher interested in my graduate research at Briercrest (2001) and would like to do business with me. Voila! 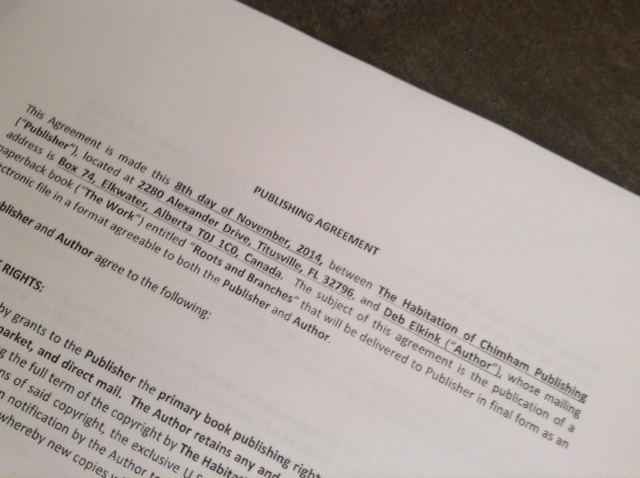 Today I formally present the results of my new alliance with Wayne Stahre of The Habitation of Chimham Publishing. Isn’t the cover lovely? My sister, Lorenda Harder, created the pen-and-ink sketch, with her daughter Averil assisting on the technical side of things. The publisher scored a foreword by Dale Alquist, president of the ACS, and several other Chesterton scholars weigh in as well with endorsements (among them Bruce Hindmarsh of Regent, mega-blogger Brandon Vogt, and GKC expert John Coates). In a few days you’ll be able to find Roots and Branches at your favourite online bookstore. Or watch for me and my pile of copies at a conference near you! Congratulations! I am so proud of you, Deb! You could pull away from being absorbed in your new novel to work on this non-fiction book “Roots & Branches” then see it to completion. I love the ink drawing of the mature tree by Lorenda. The powerful strokes give it a feeling of strength & wisdom. It is great that Averil could assist! My artistic family, what a gift! Thanks so much, Mom. It takes a lot of people to get a book together, and I’m grateful for all the help. I’ve already been asked to consider an arts interview by someone who interviewed me for my first novel (voice over the Internet). Thank you all. It has been my privilege to add a small part to this significant book…and what a wonderful way to be introduced to Chesterton! I am already voraciously eating up “Roots & Branches” and have purchased a couple of Kindle books written by G.K. himself…they are waiting in line. GKC is really an interesting character. He was not widely known for his fiction and that made him unchartered territory–perfect research material. Lorenda, I think you’ll just love THE FLYING INN, which I’m sure you’ll reach for once you read Part II of ROOTS AND BRANCHES. It’s said that reading fiction requires willing suspension of disbelief. 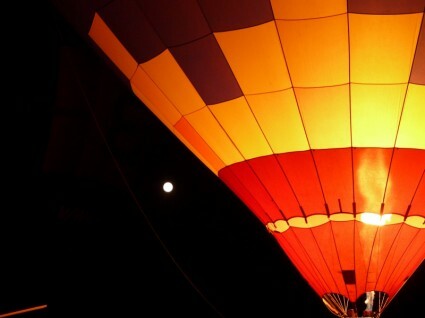 We writers strive to weave a fictional dream of gossamer threads and avoid anything that might break the spell we cast. And so we choose our genre and build our story idea around specific conventions—checking vocabulary lists for children’s sci-fi, building psychological tension into thrillers, consulting timelines for historical fiction. We study the markets and adapt our approach to connect with the audience in mind. There’s no end to the preparation and research we undergo as we hone our craft by studying how-to books and attending writers’ workshops and reading great literary works. Our method is limited only by our diligence. Popular writers apply a variety of stylistic methods in their novels—think of the unconventional plot of The Time Traveler’s Wife, the language of Harry Potter’s magical spells, the sensuality in The Picture of Dorian Gray. Generally speaking, we can regard genre as neutral (excepting, perhaps, erotica or horror, where the purpose of the fictional dream might be sinful). The Christian is the one whose imagination should fly beyond the stars. Literature is built on a grand paradox: It is a make-believe world [fictional method] that nonetheless reminds us of real life and clarifies it for us [spiritual message]. I once attended a panel on which Christian agents, authors, and editors were asked what was more important to fiction—method or message. Did they favour character- and plot-driven manuscripts of high quality, or was theological meaning peremptory? The ensuing discussion criticized the heavy-handedness that for so long defined “Christian” fiction as something that imparted moral lessons. Writing is inseparable from a point of view . . . You can’t write and not have a point of view. So how do we, as Christian writers of fiction, ensure our spiritual message comes through our genre’s method? Christians believe that the Bible and the system of doctrine derived from it are authoritative for thought and practice. Christian involvement with literature, therefore, begins with the belief that the Bible and its doctrines will determine how we should view literature itself and will provide a standard by which to measure the intellectual content and morality of literature that we read and write. Paul the Apostle, grappling with allegations made by legalists trying to discredit his message of grace, argued for allowing changes in method of communication in order to suit the audience—as long as the message didn’t wander from the truth of the Word (Gal. 1; 1 Cor. 9:19-23). Paul made cultural and stylistic changes in the way he preached but never compromised God’s propositions. In the same way, our unchanging message becomes appealing to fiction readers when we adapt our method to their sensibilities. Great Christian fiction is able to “steal past a certain inhibition,” as C.S. Lewis put it; that is, transcendent morals properly fictionalized can slip by the sleeping dragons of reader resistance to truth. I love your approach, especially that last paragraph! This explains it so well! I’m currently in the South of France, where the countryside in warmer seasons is saturated in lavender and olive, yellow and azure. 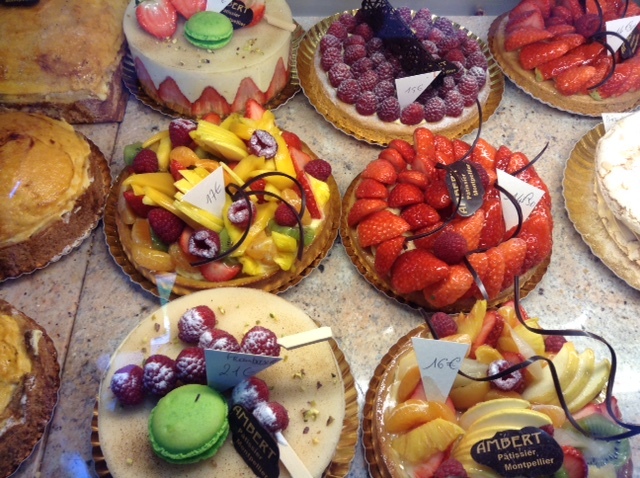 But it is winter even here, and so the colours are more subdued–except in bakery windows! French baking always tastes as good as it looks. 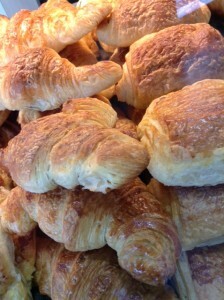 This comes as a surprise to me every time I bite into a crusty croissant, flakes flying into the air, or lick a dollop of chocolate from a mousse cake, or crush the ripe raspberry of a tart, its flavour exploding in my mouth. It surprises me that such beauty to the eye gives such pleasure to the taste buds, that the gastronomic reality is equal to the artistic presentation. (I sound almost sacramental here!) I have to admit that this is not the truth for most Canadian bakeries, where too often pristine cakes smothered in snowy icing and piped in berry blue taste of styrofoam wrapped in bitter lard–a temptation only to naive children who won’t believe for a while yet that what you see isn’t necessarily what you get. 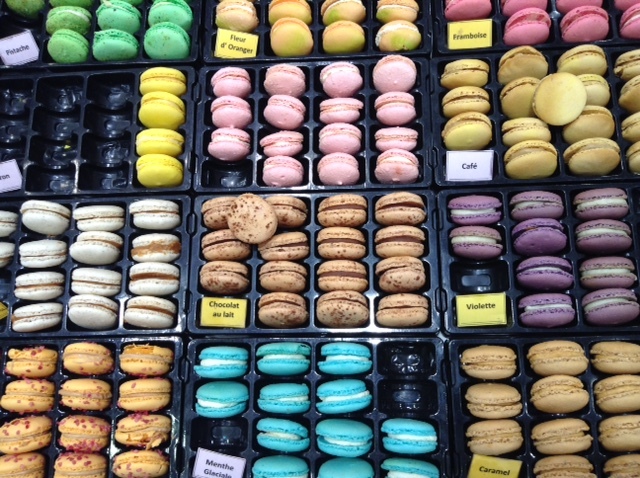 And yet here in France, it seems, every bite is true. I see a philosophical corollary here, of course: Am I internally the person I attempt to project outwardly? Am I made of quality ingredients or substandard fluff? Does my character satisfy or disappoint? But I have to be honest here. Call me shallow, but more important to me at this moment–as I wander the cobblestones and backstreets of a country where father taught son taught grandson the great culinary arts, where ingredients are treated as family secrets, where agriculture is a proud tradition and people shop the local markets daily–more important is my mouth. French baking could almost convert me to hedonism. I love the imagery of this post. I hate to go there, but how are the prices for the French baked goods v. Canadian? Wayne, the price of food (like breads and pastries, if not full meals) is extremely reasonable. You can buy the best croissant for $1US (or a dozen for 30 cents each), and a small baguette about the same. 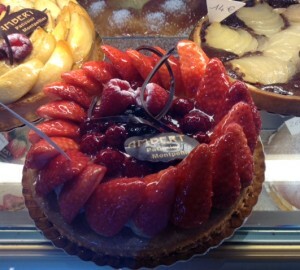 A raspberry tart (for two to share) is about $3.25 at a sit-down cafe, with an espresso under a dollar. Meals are another thing; unless you dine at noon on the “plat du jour” (almost always a deal, and delicious to boot), they can be as expensive as at home BUT always seem to taste infinitely better. Okay, you sold me on it! My mouth is watering. You have an appreciation for beauty and able to describe it in such excellent terms! Having had the pleasure of having French pastry in France myself, I completely agree with you! I know what you are saying about some of our Canadian desserts. It fools me every time. Thanks for the post card of Picasso’s art plate. I think he did quite a number of them. France speaks art everywhere. Thanks, Mom! I think the reason for the exceptional quality of the French (European?) 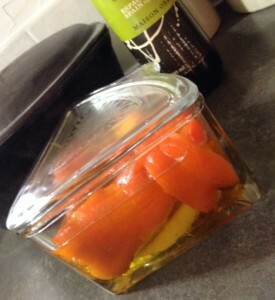 baking is often the ingredients used. I must say that I’ve had some wonderful desserts at YOUR table, and also from the kitchens of many friends who, like the French, pay special attention to details and quality of what’s going into the mixing bowl. 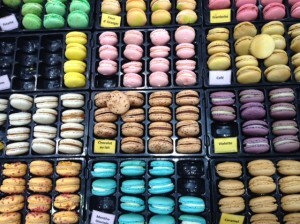 But really, as far as store-bought goodies, the French have it all over anything I can purchase at home! 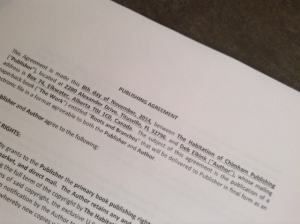 I just signed my second book contract! The flush of excitement (fear?) isn’t nearly as overwhelming this time, maybe partly because publishing this book isn’t really a “new venture” but a reworking of graduate research I completed back in 2001. 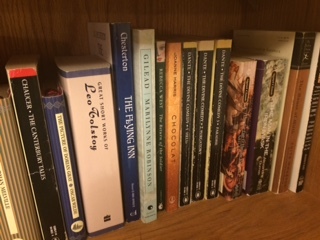 When I returned to the classroom, after finishing off home-educating the third child, I found just the scholarly and spiritual nourishment I was looking for. Seminary offered me access to the brilliant minds of godly professors who urged me on towards my goal of clarifying my religious beliefs and rebooting my literary skills so that I could write theologically informed fiction. It worked, though it took me a while. 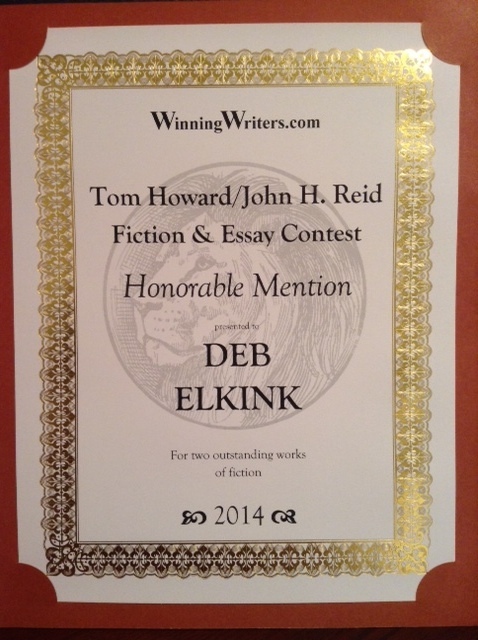 My subsequent novel, The Third Grace, won a Canada-wide, “book of the year”-type of award in 2012 and (besides all sort of editing and other writing-related work) I’ve placed in several short story contests as well. I’ve been busy with drafting my second novel and am on the brink of sending off a proposal for it to attract the agent of my dreams. So when, a couple of months ago, I received an email out of the blue from a small publishing house interested in my decade-old research on G. K. Chesterton–the late-Victorian apologist, essayist, and novelist–I faltered. The publisher told me how, as a member of the American Chesterton Society, he was reading a novel by GKC that needed explanation–and he found my article online and loved it. Still, I couldn’t quite believe there was a niche audience wanting to read an academic book full of footnotes, but the publisher patiently prodded me, answered my questions, assured me of veto power, raved about the content, and promised me some fantastic endorsements–which he is delivering on. There are few intellectual exercises more rewarding than the close reading of a Chesterton text. And too few critics have made the effort. . . . Perhaps they are intimidated to offer a critical analysis of a writer who is himself a master literary critic. 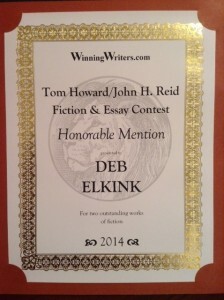 But Deb Elkink has risen to the challenge. So I’ve signed and am now immersed in edits and emails and eating/sleeping/dreaming all things Chesterton. And I like it. I’m having fun and learning loads. Moral of the story: Write with all your heart. You never know who will read your words–or when–and bring them back to you. But now my novel manuscript is calling me . . .
A great chance for me to congratulate you on getting the book on Chesterton “Roots & Branches”published, or into the hands of this publisher. Even though you didn’t expect to have anyone ever read it! I’ve known you to be thorough in everything you do, and this is a great example of your commitment to who you are. I am so delighted to have won TWO honourable mentions (with the third short story I entered also selected as one of 35 finalists) in this wide-reaching contest that attracted well over 1,000 entries, awarding only 12 prizes. And in my delight I’ve been sharing the news everywhere, many friends and associates rejoicing with my giggling joy. I mean, who’d know if I didn’t tell them? It’s encouraging to me to be recognized by such a popular, international contest (judged blind, my name not appearing on the entries). The money I received wasn’t significant, nothing like the Grace Irwin prize offered yearly by our own Canadian organization, The Word Guild. But gaining recognition in these types of contests tells me that I’m on the right track–and every writer needs that sort of encouragement. I hope that my advertising spurs on other writers in my circles to enter contests or send out pieces for publication, even older work like the stories I submitted. We need to get the word out that writers are appreciated and being read. But I wonder where the line is between sharing of news and prideful crowing? When pride comes, then comes disgrace, but with the humble is wisdom (11:2). Pride goes before destruction, and a haughty spirit before a fall (16:18). One’s pride will bring him low, but he who is lowly in spirit will obtain honour (29:23). My sister assures me that feeling proud is correct (as in the dictionary definition: “much pleased [exultant] . . . having proper self-respect”). I know that in my heart I don’t feel the sort of pride that elevates my own opinion of myself above others (as in the biblical story of Lucifer); rather, I give the glory to the God who created me and affords me the opportunity to write at this time in my life. Like clouds and wind without rain is a man who boasts of a gift he does not give (25:14). How do I avoid becoming a cloud without rain? How do I better give of my gift? Thanks for the comment, Eleanor. Over and over I’m being told by many sources that, especially in this current publishing environment, we writers need to market ourselves, but this doesn’t sit well with me. I’m conflicted. Lori, thanks for that interesting link. The blogger teases out the difference between pride and conceit, and the role of humility in allowing pride to express itself in a beneficial and proper way. Reading the link (Lorenda) on pride-conceit helped me to re-define the difference. I think some people can only see one side or the other. Maybe a reflection on their own views?